Two Woodrow Wilson School alumni made national headlines by taking new jobs in Iraq last week. On Jan. 5, President George W. Bush selected Lt. Gen. David Petraeus *87 to be America’s chief commander in Iraq, and three days later, the president named Ryan Crocker, a former Wilson School mid-career fellow, to replace Zalmay Khalilzad as ambassador to Iraq. In one report, NPR took note of Petraeus’ Princeton background and the topic of his Ph.D. thesis: "The American Military and the Lessons of Vietnam.” Petraeus was featured in a 2004 PAW story and a 2002 PAW interview. … Several New York newspapers reported the appointments of incoming Gov. Eliot Spitzer ’81, which include at least two Princetonians. David Nocenti ’80, who was Spitzer’s counsel in his time as New York’s attorney general, was named counsel to the governor. Anthony Shorris *79, a Wilson School lecturer and former director of Princeton's Policy Research Institute for the Region, will be the executive director of the Port Authority of New York and New Jersey. … And elsewhere in New York, former Tiger baseball star Ross Ohlendorf ’05, a minor league pitcher, was one of four players traded to the New York Yankees Jan. 9 in a deal that sent Yankee star Randy Johnson back to the Arizona Diamondbacks. New York Daily News columnist Bill Madden highlighted Ohlendorf as the key prospect in the trade, reporting that he could find his way into the Yankees’ bullpen in 2007 or 2008. Alexis Chiang ’98 and Tim Colvin ’97 of New York City take advantage of the mild weather for outdoor photos after their wedding ceremony Jan. 6 at the University Chapel. Temperatures were in the 70s as the couple posed near Whig and Clio halls. In the last weekend before the first semester exam break, several Princeton winter sports teams will face Ivy League opponents in key games. On campus, women’s basketball and men’s hockey are the headliners. Women’s basketball beat Penn Jan. 6 in its Ivy opener as Meg Cowher ’08 (22 points) led Princeton in scoring for the 11th time in 15 games. The Tigers host Columbia Jan. 12 at 7 p.m. and Cornell Jan. 13 at 7 p.m. At Baker Rink, the men’s hockey team will try to rebound from last weekend’s loss to Quinnipiac, facing Yale Jan. 12 at 7 p.m. and Brown Jan. 13 at 7 p.m.
Princeton men’s basketball will start its Ivy season on the road with games at Columbia Jan. 12 and at Cornell Jan. 13. At 9-4, the Tigers are off to the best start of the eight Ivy teams, but they are taking nothing for granted entering the weekend: The Lions and the Big Red each split their games against Princeton last season. Longtime Princeton faculty member and Plasma Physics Laboratory scientist Martin Kruskal died Dec. 26 at age 81, but his contributions will live on in applied mathematics – and in a card trick that bears his name. The “Kruskal Count,” employed by amateur magicians, is a trick that uses a standard deck of 52 cards and the mathematical principle of Markov chains. The magician asks a subject to pick a number between 1 and 10, which the person does not reveal. Using that number, the subject works his way through a deck of cards using the following rules: Count off the secret number of cards to get a “key card”; in the example below, the subject’s number is 7, so the first “key card” is the four of spades. Then, use the number on the key card to count to the next key card. Aces are worth one and face cards are worth five. 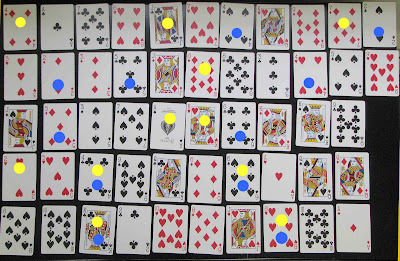 The subject's sequence is shown with blue dots below, and the subject is asked to reveal the cards evenly, as not to tip off the magician. At the same time, the magician follows the same counting process, shown with yellow dots, starting with his own secret number. (It helps to use 1, as in the example below.) When the subject reaches his last key card, the magician can identify it because it is the magician’s key card as well. The chains have converged. Posted by Brett Tomlinson, with reporting by Katherine Federici Greenwood.